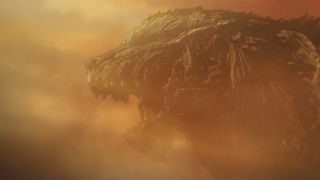 Godzilla won't grace the screen in live-action form again until 2019, but fans of Big-G can still get their recommended dose of kaiju thanks to a trilogy of anime films coming to Netflix. The first, Godzilla: Planet of the Monsters, is practically just around the corner (or, if you're as big as Godzilla, a pinkie toe away). It's coming January 12. Of course, maybe that's to be expected since these movies take place 20,000 years into the future. And while it looks like humans have long ago fled to space, they aren't content to let Godzilla wander around their former home. They'll throw everything they have at the world's most famous monster, and it's been confirmed that in the second film, that includes a human-built beast of their own: Mecha Godzilla. If you're not already salivating, a quick explanation: First introduced in 1974 as a villainous machine piloted by aliens, Mecha Godzilla quickly grew to be a favorite among fans. Sometimes he's good, sometimes he's bad, but he always appears as a giant robot anime-inspired copycat design of Godzilla. And personally, I don't think we're going to get this classic foe in live-action anytime soon, so I'm happy to watch just for that alone.